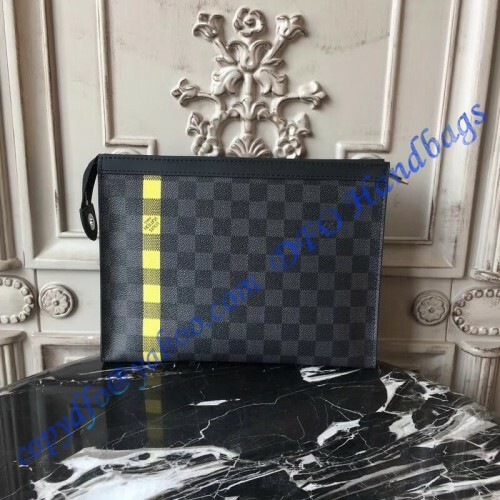 The Louis Vuitton Damier Graphite Stripe LG - D19 Pochette Voyage MM Helios can be seen as a fashion accessory that makes all possible. It is designed and made to be used either as hand-held or bag in bag creation and it does both things perfectly. We liked this small Pochette very much and the chances are high that you will love it as well. 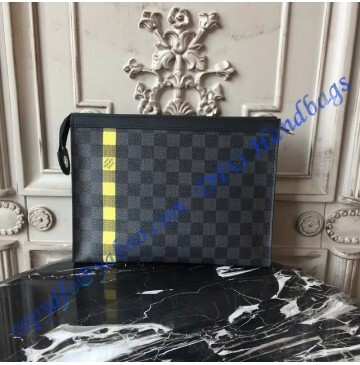 The Pochette looks great on dark canvas, but there is also a yellow line that makes it different than all the other models available on the market. The same goes for the light green interior. 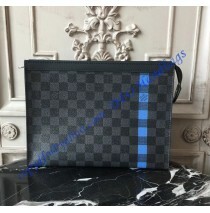 All you will want to know about the Louis Vuitton Damier Graphite Stripe LG - D19 Pochette Voyage MM Helios is basically the looks and the practicality. You will be the owner of a modern and stylish little Pochette that will help you keep all the belongings close to you all day long. In addition, this creation will make you noticed as well.